Fox News host Tucker Carlson on Sunday said he was outraged that the media portrayed Jessie Jackson and Al Sharpton as civil rights leaders because both men were simply "hustlers and pimps." LOL. Take a look in the mirror fella, and fix that dang typo in your first name. We all know it starts with an "F", not a "T". But, you, Carrie, thank you for posting it,. If you are going to tell a lie make it a big one!!!! Well....._ucker, by saying that and constantly racking muck and taking big bucks for your blather....that makes of you a WHORE. 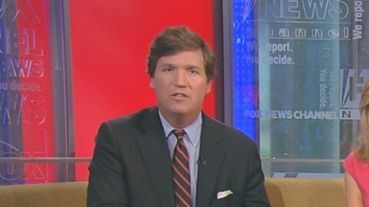 I am outraged that the media portrays Tucker Carlson as a journalist when we all know he is a hustler and a pimp. Also he can't spell "Jesse." Icky Carlson is nothing but a slimedweller in a suit. Why doesn't FAKE NOOZ get sued for their slander? So _ucker thinks one must live in Fl to have opinion on this? Faux noise entertainers (with my sincere apologies to real entertainers) are so full of themselves I'm surprised they don't explode off the stage. Sharpton and Jackson haven't caused anything, the prosecution caused the outcome. And Tucker Carlson is a third-rate journalist looking for attention. He makes Geraldo Rivera look like Walter Cronkite. He even resorted to being a contestant on "Dancing With the Stars"! An arrogant child of wealth and privilege grew up into an arrogant jerk. I'm glad he dropped the bow tie after he was "hit on" by a gay man (with very poor taste) in a public restroom. It's bad enough that this stupidity gets airplay, I thing the best thing is to just ignore it a not give it more attention than it's worth. Carlson is a joke like all of Fox News employees. What a moron.